Several weeks ago in December we were lucky enough to have the time to visit Hidden Fields Farm, a local Christmas tree farm run by Robert McDowell, his wife Cecille and their sons Joe and Erin. Situated on the Rich Patch Mountain Plateau, the farm has panoramic views of the local mountains and rolling hills here in Alleghany county. Visiting the farm to cut down a tree for Christmas on a cold and snowy day would be a beautiful way to celebrate the holiday season with one's family in the years to come. Along with whole Christmas trees, Hidden Fields makes and sells their own wreaths providing us with our beautiful locally made wreaths this holiday season. In their workshop they've sold almost 200 pieces this season, including garlands, door charms and mailbox hangers. 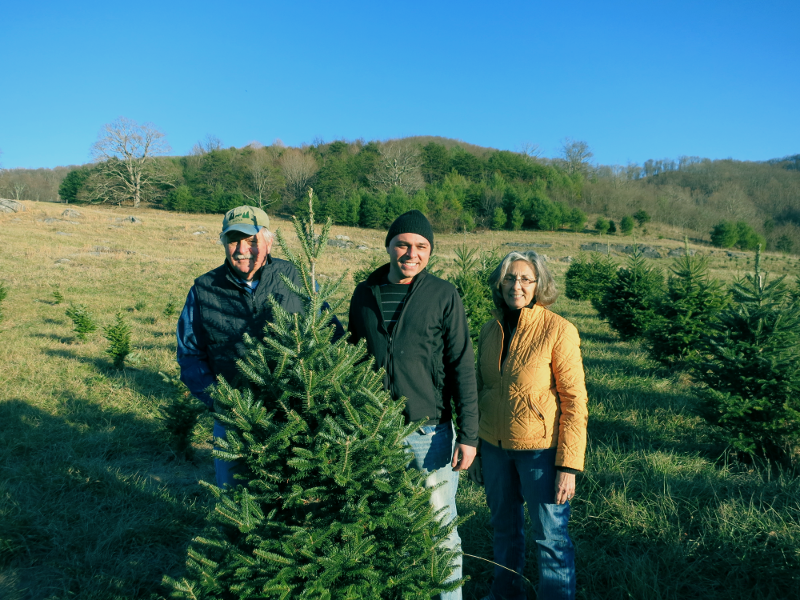 While the McDowell's have had their property since 1990, they started their tree farm in 2012. They estimate that they've planted over 6,000 trees since they started with some familiar varieties- Frazier, Colorado Blue Spruce, Cedar and White Pine, as well as some unfamiliar- such as Concolor Pine, a fragrant fir native to the western U.S. that smells just like citrus. They are members of the Virginia Christmas Tree Growers Association and are glad to be a part of the solution to Virginia's Christmas tree shortage. Their farm is located at 7510 Roaring Run Road in Covington, VA.